The Reluctant Traveler (TRT) Diaries are the chronicles of someone (me), who has never really desired or dreamed of traveling the world, suddenly finding himself doing exactly that. Travelling is always interesting. Often it is even enjoyable, that is, once you get there. And there are always surprises. The TRT Diaries are mostly pictures pages with a bit of a story line. I dream of the day when they have finally have the Star Trek transport beam system working. Step onto a dance floor, evaporate in a column of bubbles, and appear at your destination moments later in another column of bubbles. No luggage necessary, you just need a cell phone with the tricorder option so you can figure out what's in the food. In the meantime we use planes, trains, and automobiles for transport. Somebody asked me, somewhat bewildered, what I don't like about traveling. Uh - planes, trains, and automobiles? This will be the last entry in the The Reluctant Traveler Diaries for St. Petersburg and Russia. If you are starting with this blog, you may have missed some important background information of why TRT ended up in Russia. Then again, you probably did not miss anything at all. We have used up all the good pictures now and spent most of the time talking about tourist things. It's now time for a little cultural trash talk. Update: Someone has removed one of the best YouTube music videos ever. I enjoyed it every time I viewed it. Substituted another link here, which has shadows of the original video. Real music begins (and vignettes of the original video) at 3:15 into this link. There are 17 palaces listed on the St. Petersburg website and most of them open to the public. Some are museums. We only visited the insides of three palaces, which was enough. And then we saw Peterhof. We didn't go inside, just walked around in the gardens. WOW! This is a photo album blog about St. Petersburg, Russia, the second in the TRT Russia chronicles. What this means is that you can click on any image (one click, not two) on this page to view a large photo of the image. Click to the right to go to the next photo, click on the left to go to the previous photo in the album. Click on the background to return to the blog. There are 27 photos in all -- enjoy! The Reluctant Traveler (TRT) returned from a trip to St. Petersburg, Russia not so recently. It is time to file a report. TRT has never dreamed of going to Russia, except maybe in those fitful dreams where one is frantically on the run from some kind of monster metaphor. It is the land of Putin dodgy dictators, the KGB cops who are more feared than the criminals, rigged elections, and mysterious billionaire oligarchs. There were about 8 lines to choose from at Border Control, a pleasant change from Chicago O'Hare, where they shout at you if you try to choose a queue. The total wait was about 45 minutes, which was also faster than in Chicago O'Hare. So I'm back from the Drupal convention in Chicago last week and it was a great experience (with the exception of the airports and planes). It was my first ever convention, and I expected about 500 people, tops. There were over 3,000. Chicago has an amazing skyline and some very impressive architecture, a blend of old and new. I've never seen so many cabs or stretch limos, but then I've never been to New York either. One of the best things about the American experience are the restaurants and the customer service. A waiter is at your table in a minute. If you can make a decision quickly; you can order your meal when he returns with the drinks. I am no longer accustomed to this. The Sheraton hotel that hosted the convention was full so I stayed at the Palomar - about 15 minutes away. It was a better price, the room and staff were wonderful, and the internet worked, unlike the Sheraton. No regrets at all. There is a restaurant in the Sheraton called Shula's steakhouse. One item on the menu is a 48 ounce porterhouse steak. I must be in America. 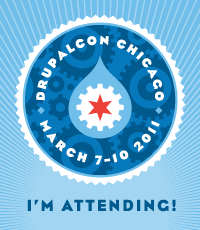 Now that the personal website is up and running with the latest version of Drupal, it is with some excitement that I announce that I'm going to Chicago for DrupalCon, a four day conference for Drupal developers. How nerdy is that? I was originally planning to go the the conference in London, England because it's closer, and London is always fun to visit (though I would never live there again). But there was a conflict. So I'm going to Chicago. The Reluctant Traveler embarked on a trip to Central America in July 2009 as the trusty side kick and porter to Lady J. The trip lasted 3 weeks and we visited the countries of Guatemala and Costa Rica. Although the two countries are less than 900 km apart, they are separated by 3 other countries - Honduras, Nicaragua and El Salvador. Central America is a poor cousin to it's northern neighbours and european cousins, but the difference between Costa Rica and Guatemala is stark. So the reluctant traveller set off to Paris to take in a bit of Roland Garros, a.k.a. The French Open, one of the four Grand Slam tennis tournaments of the year. My friend Ken had scored a pair of tickets to the quarter and semi finals on the internet. The available tickets sold out instantly but if you were on the internet at 4:00am Calgary time (the moment tickets went on sale) there was a possibility of a score. Today we begin with a new look that is a little easier on the eyes and probably much easier on the stomach. We still have a hint of orange because these pages are crafted in Holland, so expect some things to be viewed through orange tinted glasses. The Dutch are have found other uses for sand besides growing tulips. Like the former financial masters of the universe, they are masters at building sandcastles.